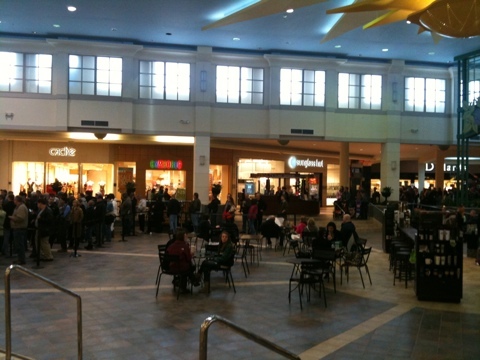 I drove to the Fairlawn, OH Apple Store to check on the iPad 2 for Y. However, I had not properly anticipated how many folks wanted one today, too. I was at the end of a line with hundreds of people in it when I arrived about 5:10pm. It was cool though to see my friends Robin and Bert already in line ahead of me. After talking with Bert for awhile, a friendly mall cop came by to tell us that there was 99% chance we wouldn’t get an iPad 2 today. I mulled around a bit, but I ultimately decided to leave for dinner takeout at Sakura. I hope that Robin and Bert score one despite the odds.